Ever since ramping up my landscape photography gear and getting out onto the trails more often with a more complete camera and filming kit, I've been aware that stuffing my LowePro Nova 140 AW II into my day back "sack" bag hasn't been a very good way of going about my hikes. While the Nova bag itself is fantastic for shorter hops around a location, it's not a backpack so it's not capable of holding any water, food or a tripod on its side. While I do prefer using a water bladder to store and drink water from on hikes, the downside of my current hiking bag is that it's just a simple pouch with one pocket on the outside. It can barely do anything functional. Leica M rangefinder and three small lenses. A Sony RX100V compact camera and TASCAM DR-05 voice recorder. A few Hoya filters in their boxes. My MacBook 12" Retina (and charger). A small bag of cards, batteries etc. Attach both my tripod and an ample-sized water bottle. Food, head lamp and other bits and pieces for a hike. I also wanted to be able to treat this as my carry on luggage to keep all of my expensive electronic devices and lenses on my person when travelling on a plane. I found it difficult initially to find something that fit these requirements while not being too large and too expensive. The LowePro Whistler series look fantastic but were just a little too expensive and excessive for my needs. In the end, I found a pack that seems to cover every requirement without compromise. I tried searching through a number of different brands but in the end I went back to my "old faithful" LowePro. I didn't know this series was what I needed and stumbled upon the LowePro Flipside Trek 450 AW while at the local camera store. The upside of using a digital rangefinder like the Leica M is that my gear is relatively tiny, so I end up with even more room for items like my first aid kit and bag of camera accessories. In the picture to the right, you can see where I've placed my camera gear. I had to play Tetris with the dividers because of how small my lenses are. Without being careful with them, they would roll all around as I moved. I managed to fit my first aid kit in the bottom section and head lamp / torch into the top right section which leaves the bag's entire top pouch to fit my food and other items, separate from my camera gear and electronics. 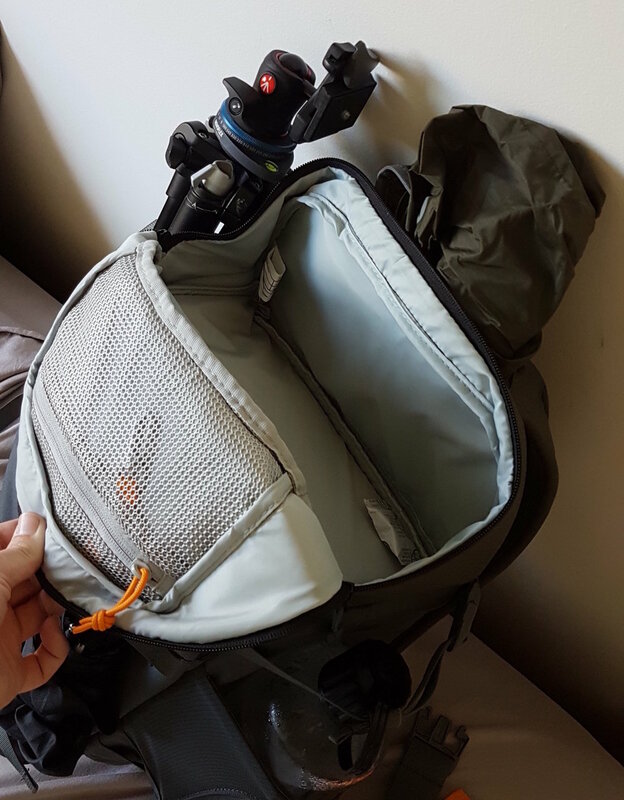 The upshot of how I managed to fit the gear into the camera section is that I have a good amount of room for hiking specific items such as water, food and space to stow a jumper or scarf during winter. With the elastic side pouches and straps, I'm able to fit my 1L water bottle and Manfrotto Befree tripod as well as attach my small umbrella to the back if the weather doesn't look friendly. The top of the bag contains a pouch that stores the rain cover that can protect your entire pack from downpours. If that wasn't enough, the backpack also has waist supports that have small zip-up pouches for stowing small items such as a muesli bar or Swiss-Army knife. I'm surprised I was able to find the perfect bag for my needs after initially struggling with the choices I came across. It not only fits my entire landscape photography, vlogging and hiking kit, it also allows me to safely carry my 12" MacBook Retina in its own neoprene sleeve while not breaking the 7kg carry-on baggage weight limit. At around $200-250 AUD depending on where you shop, this may just be the bag for you if you have similar requirements. I'm yet to give it a proper workout, but I think it's going to fit the bill just right. DISCLAIMER: This article is not sponsored by LowePro. I just love their bags because they're practical, affordable and don't look over the top (or super hipster).